Hey BossMan01...can't sign in on my new laptop using same user name and password. PM sent. Hey Mudpuppy sorry for the glitch I’m sending this to the IT guy hang tight hope to have an answer soon. Thanks Boss...odd that I have no issues with my old machine that's held together with duct tape...lol. Appreciate your efforts. Hey mike that was a "test photo" from last month.... disregard. Someone was having trouble uploading photos so this was just an admin test! Hey 24 0LTS sorry your having trouble with your photo upload there could be a couple of problems. One is the photos must be under 10 megs which most cellphone photo are. The second is the photo path. You can either use the camera icon under "whats on your mind" or you can click the Photo Gallery link in the horizontal navigation menu, then click the blue "Upload Photo" button. Give it a try and let me know if you still having trouble. just send me a direct email admin@fishzoo.net. One happy Mike o got his AWESOME Steve Fogle custom Rod and Reel Catfish combo today.... congratulations and thank you for your support Mike... can't wait to see the pic of a monster Blue Catfish, which are now apparently being caught in the Susquehanna River! Thanks again, I might try to get a shark on it this summer. ULTIMATE ANGLER ALERT - the Steve Fogle Custom Rod is in and ready for the voting poll to be activated. The only thing were waiting on is the reel to arrive... stay tuned! Great video. That Yellowfin has pretty lines. 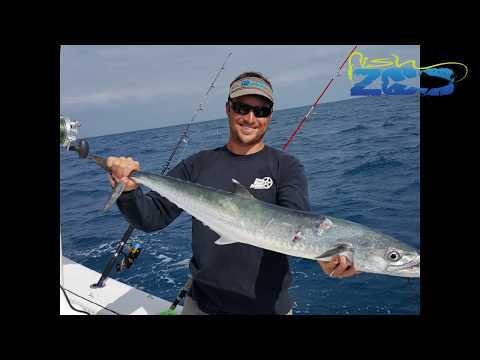 2017 FISHZOO ULTIMATE ANGLER TOURNAMENT UPDATE - CONGRATULATIONS to Mike o! He is the winning Fishzoo angler who gets the well deserved title of "Fishzoo Ultimate Angler 2017". He will also receive a gift card from either Cabelas or Bass Pro for the total amount of our google advertising income for 2017. He earned this for catching a 17.5 inch Flounder, 26.5 inch Channel Catfish, 8 inch Brown Trout, 19.5 inch Speckled Trout and a massive 40 inch Northern Pike! That's 5 species and 111.5 total inches... GREAT JOB MIKE O! Congrats Mike on the winning, well deserved. Congrats Mike! You certainly had a great year! 2017 FISHZOO ULTIMATE ANGLER TOURNAMENT UPDATE - One new additions on the leaderboard this week. Mike o has beat his own 38 inch Northern Pike with a 40 incher! I'm going out on a limb and say that will stand for the tournament. That keeps Mike o still in the lead with 5 total species. ONLY 2 WEEKS LEFT IN THE YEAR AND THIS YEARS TOURNAMENT... STILL 8 EMPTY SLOTS ON THE LEADERBOARD ANY SIZE FISH WILL MAKE THE BOARD. KEEP FISHING!!! REMEMBER the Google ad revenue is currently at $205.58 and remember that leading angler when the Tournament ends gets 100% of the Fishzoo Google Ad revenue in the form of a Cabelas or Bass Pro gift card. ALSO one of the fish on the leaderboard at the end of the tournament will be voted "Most Notable Catch" and that angler will get the Steve Fogle Custom Rod. Thanks guys, I don't know what tis going on with Loch Raven this year. The last time I caught one over 30" was in 2014. This year in 5 trips I've gotten a 35" 38" and a 40" along with several smaller ones. I thought there was a 40" there and hoped to one day catch one. By the way are any walleyes being caught at the damn? I was up there about 3 weeks ago and struck out. 2017 FISHZOO ULTIMATE ANGLER TOURNAMENT UPDATE - Two new additions on the leaderboard this week. Egriger has knocked Mike o out of the Bluefish slot with a massive 33 inches! Now that will be hard to beat. Also ReelinRon's 27 inch Striped Bass was beaten but Egriger's 32 inches. That keeps Mike o still in the lead with 5 total species. ONLY 3 WEEKS LEFT IN THE YEAR AND THIS YEARS TOURNAMENT... STILL 8 EMPTY SLOTS ON THE LEADERBOARD ANY SIZE FISH WILL MAKE THE BOARD. GET FISHING!!! REMEMBER the Google ad revenue is currently at $205.58 and remember that leading angler when the Tournament ends gets 100% of the Fishzoo Google Ad revenue in the form of a Cabelas or Bass Pro gift card. 2017 FISHZOO ULTIMATE ANGLER TOURNAMENT UPDATE - Three new additions on the leaderboard this week. Unbelievably the first Striped Bass was just posted by a new member ReelinRon who caught a late fall 27 incher. Mike o has upped the ante beating his own Pike by 3 inches. And Mike o has also added the first trout of the year with an 8 inch Brown Trout.That will likely stand until the end of the tournament. That keeps Mike o solidly in the lead with 6 total species. THERE IS PLENTY OF FISHING LEFT IN THE YEAR GUYS AND GIRLS... GET FISHING!!! REMEMBER the Google ad revenue is currently at $205.58 and remember that leading angler when the Tournament ends gets 100% of the Fishzoo Google Ad revenue in the form of a Cabelas or Bass Pro gift card. 2017 FISHZOO ULTIMATE ANGLER TOURNAMENT UPDATE - Three new additions on the leaderboard this week. Fishingfreak has taken over the Walleye and Smallmouth slots on the leaderboard with a 22 1/4 inch Walleye and a 20 inch Smallmouth. Also Mike o has added the first Pike of the season at 35 inches. That will likely stand until the end of the tournament. That puts Mike o in the lead with 5 total species. THERE IS PLENTY OF FISHING LEFT IN THE YEAR GUYS AND GIRLS... GET FISHING!!! REMEMBER the Google ad revenue is currently at $205.58 and remember that leading angler when the Tournament ends gets 100% of the Fishzoo Google Ad revenue in the form of a Cabelas or Bass Pro gift card. 2017 FISHZOO ULTIMATE ANGLER TOURNAMENT UPDATE - Two new additions on the leaderboard this week. Fishingfreak has added first Black Crappie at 13 1/4 inches and the first Sheepshead at 17 1/4 inch. While not a threat to the lead yet don't discount Fishingfreak having won this thing 2 consecutive years. Buffie85 and Mike o are still tie for the lead with 4 species each with Buffie85 holding the tie-breaker with a total length of 106.5 to Mike o's 88 total inches. THERE IS PLENTY OF FISHING LEFT IN THE YEAR GUYS AND GIRLS... GET FISHING!!! REMEMBER the Google ad revenue is currently at $188.42 and remember that leading angler when the Tournament ends gets 100% of the Fishzoo Google Ad revenue! 2017 FISHZOO ULTIMATE ANGLER TOURNAMENT UPDATE - Four new additions on the leaderboard this week. Mike o added - 24 1/2 inch Bluefish - 17 1/2 inch Flounder - 26 1/2 inch Channel Catfish. Kanati added - a whopping 21 1/2 inch Walleye. Buffie85 and Mike o are now tie for the lead with 4 species each with Buffie85 holding the tie-breaker with a total length of 106.5 to Mike o's 88 total inches. THERE IS PLENTY OF FISHING LEFT IN THE YEAR GUYS AND GIRLS... GET FISHING!!! REMEMBER the Google ad revenue is currently at $188.42 and remember that leading angler when the Tournament ends gets 100% of the Fishzoo Google Ad revenue! Post what you catch that's why it's a contest ....mine tasted GREAT . Them are "fish fightin" words! 2017 FISHZOO ULTIMATE ANGLER TOURNAMENT UPDATE - Buffie85 has been beat out by Fishingfreak92 with a 20" Smallmouth Bass. Buffie85 still holds the overall lead with an 18 inch Largemouth, 11.75 inch white perch, 33 inch Carp and a massive 42 inch Flathead. He has a comfortable lead with 4 species and a total length of 106.5". THERE IS PLENTY OF FISHING LEFT IN THE YEAR GUYS AND GIRLS... GET FISHING!!! REMEMBER the Google ad revenue is currently at $188.42 and remember that leading angler when the Tournament ends gets 100% of the Fishzoo Google Ad revenue! 2017 FISHZOO ULTIMATE ANGLER TOURNAMENT UPDATE - Buffie85 has beat out Kanati's Smallmouth bass by only 1/2 inch by adding a 18.5 inch Smallmouth. Buffie85 still holds the overall lead with an 18.5 inch Smallmouth, 18 inch Largemouth, 11.75 inch white perch, 33 inch Carp and a massive 42 inch Flathead. He has a comfortable lead with 5 species and a total length of 125". THERE IS PLENTY OF FISHING LEFT IN THE YEAR GUYS AND GIRLS... GET FISHING!!! REMEMBER the Google ad revenue is currently at $169.42 and remember that leading angler when the Tournament ends gets 100% of the Fishzoo Google Ad revenue! 2017 FISHZOO ULTIMATE ANGLER TOURNAMENT UPDATE - Mike o has beat out Shady's Speckle Trout by adding a 19 1/2 incher. 4 1/2 inches larger than Shady's 15 incher. Buffie85 still holds the overall lead with an 11.75 inch white perch, 33 inch Carp and a massive 42 inch Flathead. REMEMBER the Google ad revenue is currently at $169.42 and remember that leading angler when the Tournament ends gets 100% of the Fishzoo Google Ad revenue! 2017 FISHZOO ULTIMATE ANGLER TOURNAMENT UPDATE - Shady has added the first Speckle Trout of the tournament at 15 inches and Kanati adds the first Blue Catfish at 27 3/4 inches. Buffie85 still holds the overall lead with an 11.75 inch white perch, 33 inch Carp and a massive 42 inch Flathead. REMEMBER the Google ad revenue is currently at $169.42 and remember that leading angler when the Tournament ends gets 100% of the Fishzoo Google Ad revenue! Fishzoo and a few of its members took to the water. We had sticks in hand and there were even nets involved but we were not fishing! The water was frozen and the sticks were hockey sticks, the nets... well lets just say we had a little trouble putting anything in them. Well, it was for a good cause and hopefully Team FZ had fun. Thanks guys. I wish her the best Merrill... thoughts and prayers!!! Sorry to hear that Merrill...will keep her in my prayers. 2017 FISHZOO ULTIMATE ANGLER TOURNAMENT UPDATE - Buffie85 has taken over the leaderboard with an 11.75 inch white perch, 33 inch Carp and a massive 42 inch Flathead. Also Kanati beat out Flyrob's Smallmouth Bass with an impressive 18 incher. Buffie85 holds a solid lead with 4 species and Mer47 has second place with 2 species, Kanati holds 3rd with 1 species. REMEMBER the Google ad revenue is currently at $153.68 and remember that leading angler when the Tournament ends gets 100% of the Fishzoo Google Ad revenue!